Above: The two masts at Black Hill in April 2010, the earlier structure appearing the taller from this northerly position. THE BLACK HILL TRANSMITTER is the UHF and BBC National FM main station for the central lowlands of Scotland, serving both Glasgow and Edinburgh and much of the surrounding territory across Lanarkshire, Renfrewshire, Ayrshire, Lothian and Fife. It was originally the main ITV 405-line VHF transmitter for the same area and also the first ITA transmitter to be established in Scotland. Typically, it is sited adjacent to what was formally the equivalent BBC 405-line Band I station for the area, this being the transmitter at Kirk o'Shotts which now broadcasts various DAB radio services. Black Hill originally transmitted UHF from the station's 1961 structure which is a 306.5 metre (1005-ft) triangular cross-section lattice stayed mast. 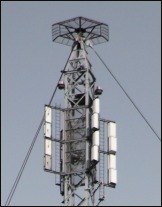 Originally built to replace the initial 1957 structure (see VHF History below) it was however unable to meet the engineering requirements for Digital Switchover and therefore succeeded for the purpose of television transmission by a further new mast, construction of which began in the latter part of 2008 and completed in 2010. 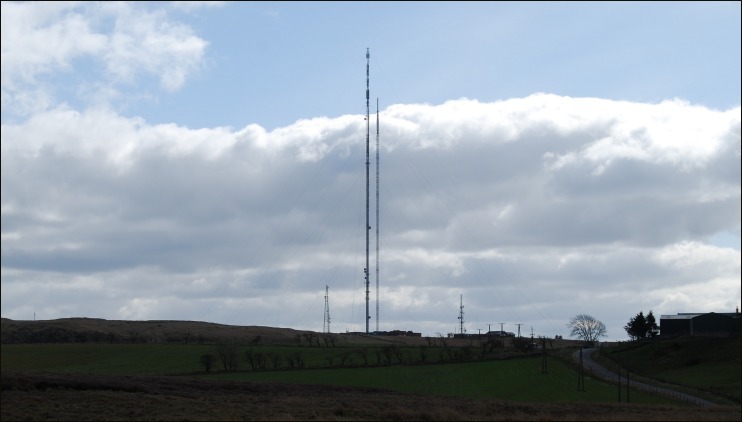 The replacement of an existing 306-metre (1000-ft) mast has also taken place at Caldbeck, this being the one other site of ITA origin to require a new structure for Digital Switchover. The stations at Divis, Rowridge and Tacolneston, which are all former BBC sites, have also undergone mast replacement for the switchover. Black Hill became the last main transmitter site in Scotland to complete Digital Switchover, the two stages of the process taking place on 8 June 2011 (DSO1) and 22 June 2011 (DSO2) respectively. Since then, all television transmissions have been from the new mast with the original structure expected to be retained at reduced height to continue with FM and DAB radio transmissions. The station has a history of unusual aerial installations dating back to the 405-line VHF system. (See VHF History below). 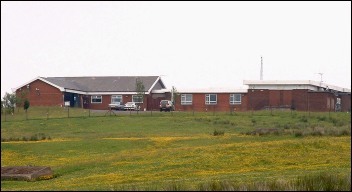 The Black Hill station was built by the Independent Television Authority (ITA) in order to establish an ITV service in Central Scotland on the original 405-line VHF Band III system. 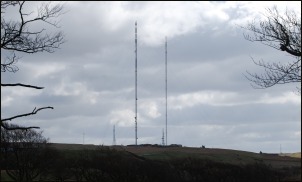 The area was the fourth in the ITV network roll-out with Black Hill the ITA's fifth transmitting station - two having been required for the North of England region. 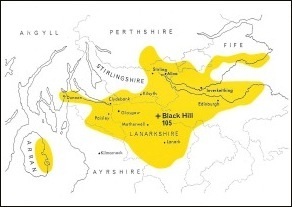 The Black Hill site was approximately fifteen miles east of Glasgow and roughly halfway between the aforementioned and Edinburgh. It was also close to the existing high-power BBC Band I transmitter at Kirk o'Shotts, enabling the ITA to once again adhere to the practice of adjacent siting, having deviated from this with their third and fourth stations located in Northern England. The catchment area of the transmitter would naturally include both Glasgow and Edinburgh but the ITA also aimed to cover the city of Dundee, some 50-60 miles away on the east coast. 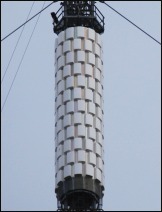 This required, as it did at may other sites, the development of an aerial with highly-directional capabilities but in this instance the authority went against convention by designing a system that would sit inside the mast framework instead of the normal external mounting, mainly to reduce the effects of both ice and wind loading on the structure. This was made possible in part by the equally unconventional use of a 750-ft (228m) mast with square cross-section rather than the usual triangular. From this aerial system, the maximum effective radiated power of 475kW (vision) was directed north-east towards Dundee whilst 250kW was directed south-west towards Ayrshire, with the north-west and south-east receiving 150kW, all delivered from two 10kW (actual power) vision transmitters and two 2.5kW sound transmitters. However, it was clear before the station came into regular service that this system was not performing as predicted, the problems ranging from insufficient power in some directions (most significantly towards Dundee) to more complex issues such as a shift in signal polarisation from the intended vertical to horizontal in respect of transmissions towards the south-west. The overall effect of this was a somewhat reduced and partially displaced coverage area. Pending a solution to these problems, the station came into regular operation on 31 August 1957 with Glasgow-based Scottish Television providing the regional service. The solution to the aerial problem, which eventually came in 1959, was to scrap the 'inside the mast' system in favour of a standard externally mounted arrangement. The only way to implement this without interrupting the service was to install the replacement aerial on a new mast. With this being the sole viable option, the ITA took the opportunity to upgrade the site to a 1000ft (306m) mast in order to augment the performance of the new aerial. Construction of the new triangular cross-section mast, in close proximity to the existing structure, began in August 1960 and became fully operational on 10 July 1961. The original mast was then dismantled and soon re-erected at the new Selkirk station in the Scottish Borders, from where it became operational again from 1 December that same year. The performance of the new mast and aerial was deemed to be 'satisfactory' producing an overall improvement in reception and an expanded service area that was as near as it could be to that originally intended. In practice, this meant that fringe areas saw a significant improvement in reception, with the exception of the Dundee/Tayside area which remained problematic and which by this time was also receiving mediocre coverage from the then recently opened Durris transmitter. This issue would be resolved finally in October 1965 when the Dundee area received its own local transmitter at Angus, with Scottish Television formally losing the territory to Grampian Television in the process. On 9 July 1966, Black Hill began transmitting BBC2 and as such became the first transmitter in Scotland to broadcast UHF. With a high mast capable of supporting UHF aerials and a site with plenty of ground for expansion, Black Hill was an obvious choice for UHF compared to the BBC Kirk o'Shotts site. UHF transmission for BBC1 and ITV commenced from Black Hill on 13 December 1969, the station falling within the second group of transmitters to have these services upgraded to 625-line colour. From the same date, the ITA Colour Control Room (CCR) for Central Scotland came into operation at Black Hill. This continued until 1981, when the station followed Croydon, Emley Moor and St Hilary in becoming the base of one of the four IBA Regional Operation Centres (ROCs) built to replace the original fourteen Colour Control Rooms. The Black Hill ROC was responsible for monitoring IBA transmitters across the whole of Scotland and Northern Ireland, thereby absorbing the CCRs at both Durris and Black Mountain. 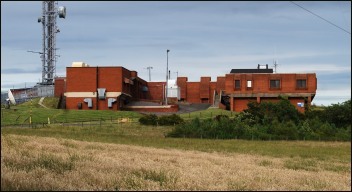 Later on, the BBC moved their equivalent Monitoring and Information Centre (MIC) from Kirk o'Shotts to Black Hill, resulting in the construction of an additional operations complex near the mast base.